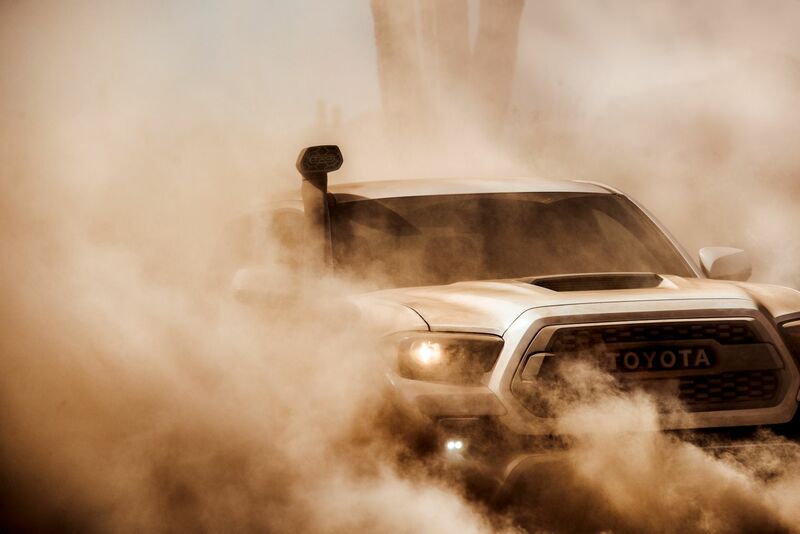 First unveiled in 2015 in Canada, the TRD Pro lineup was born from Toyota’s rich racing and off-road heritage. 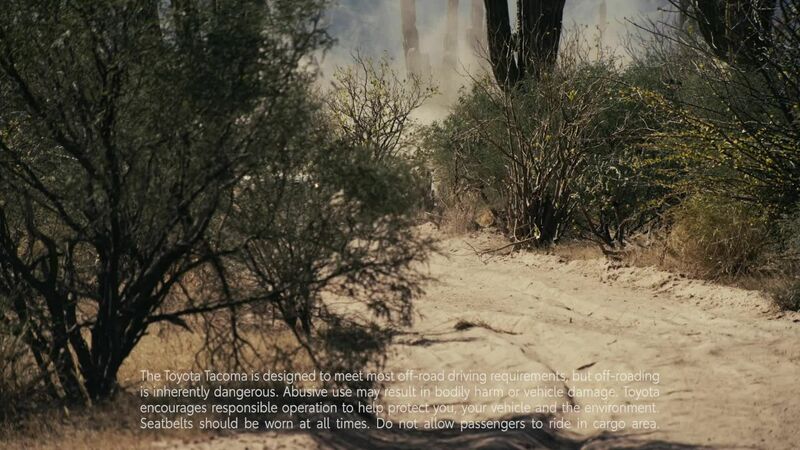 All TRD Pro vehicles offer unique styling, as well as highly capable, tried and tested performance off-road equipment, specifically tailored for when the pavement runs out. 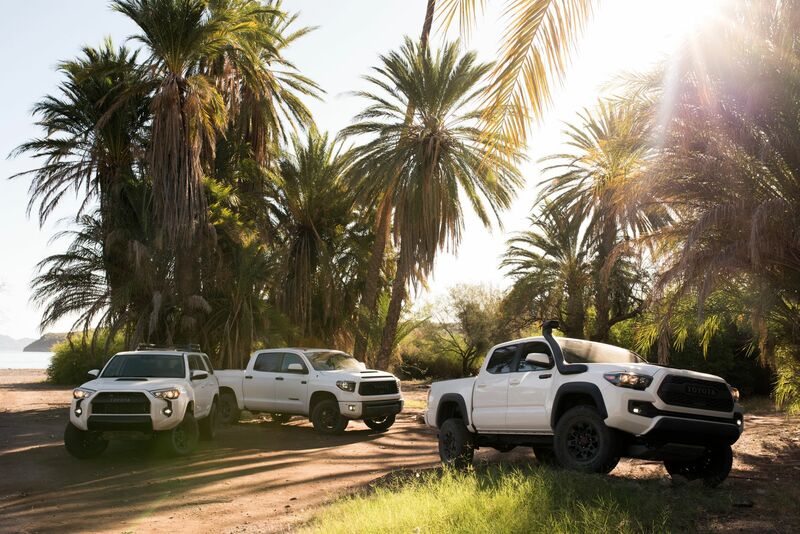 The 2019 TRD Pro series will be available in fall of 2018, and each vehicle will be offered in three colours that include Super White, Midnight Black Metallic or Voodoo Blue (a TRD Pro exclusive colour). 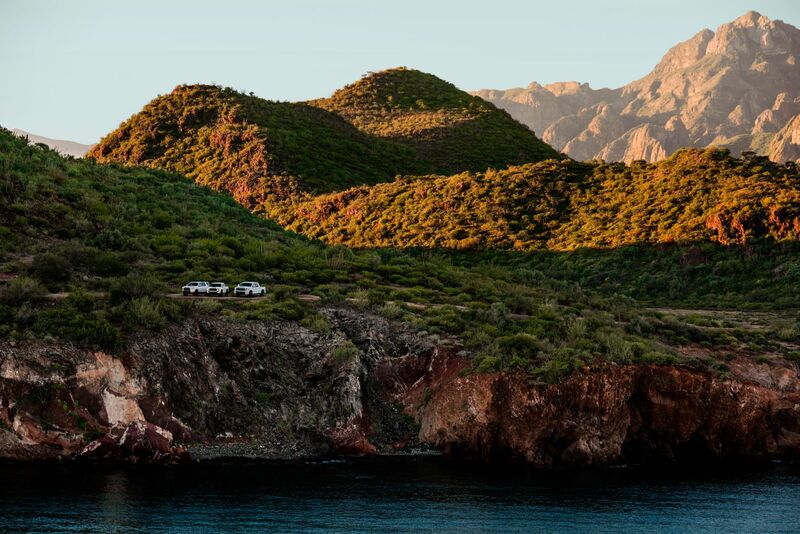 Wanna go off the beaten path? TRD Pro is the ultimate tool to get you there and back. 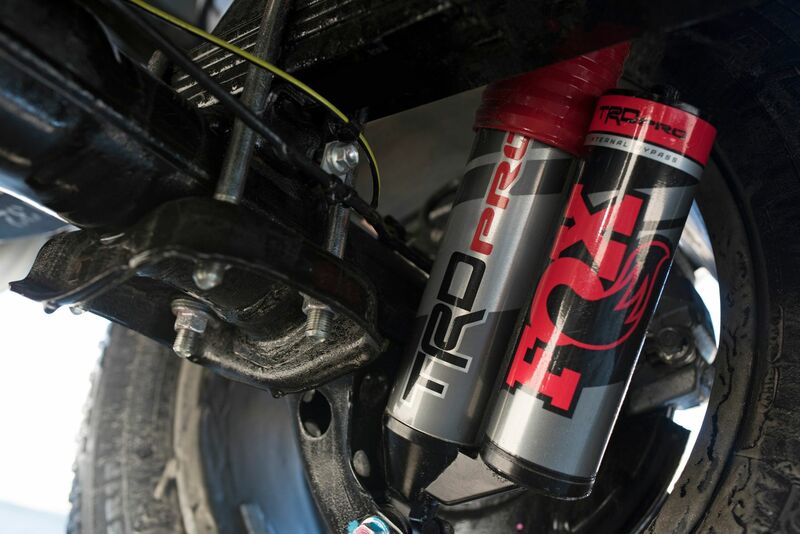 Every TRD Pro model features rear 2.5-inch Fox shocks that utilize a piggyback reservoir to house additional oil volume, which assists in maintaining peak damping performance during extreme use. Tundra relies on the beefy rear leaf springs also equipped on the TRD Off-Road grade, 4Runner utilizes the TRD Off-Road grade rear coil springs, while Tacoma features progressive-rate off-road leaf springs out back to allow more compression suspension travel to aid performance over rough terrain. 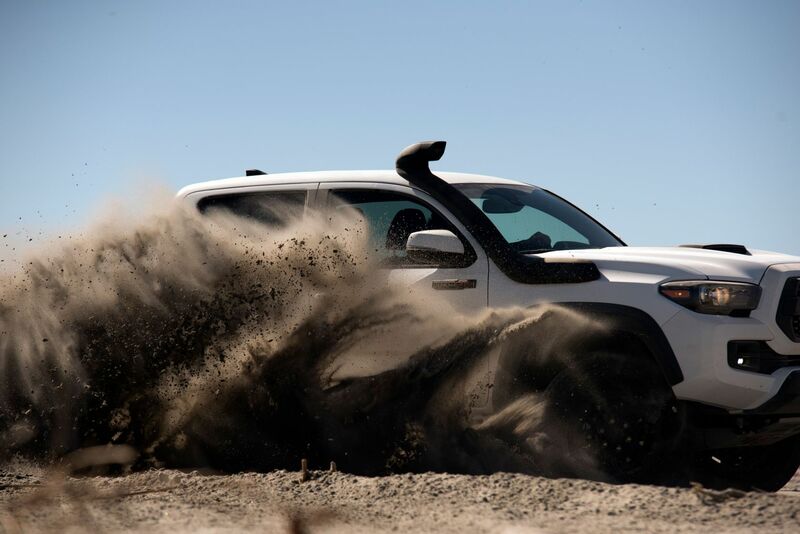 TRD dust boots are utilized front and rear to offer added protection to help keep dust and dirt out, and 4Runner utilizes unique roost shields to protect the inverted rear shock. 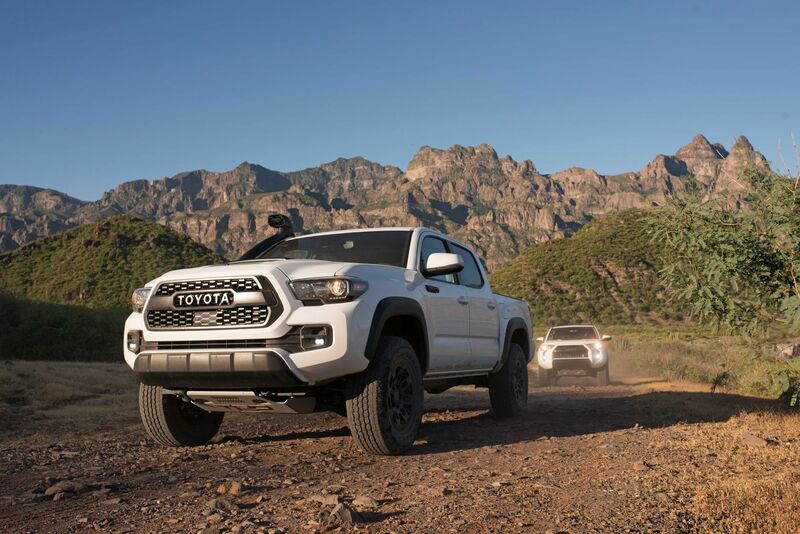 Based on the very trail-capable TRD Off-Road grade, Tacoma TRD Pro ups the ante with enhanced 2.5-inch Fox front shocks that use a large 46mm piston and feature 8 bypass zones (5 compression, 3 rebound). They are paired with TRD-tuned springs that provide an additional 1 inch of front lift. A larger front sway bar is employed to retain crisp steering and refined road manners. 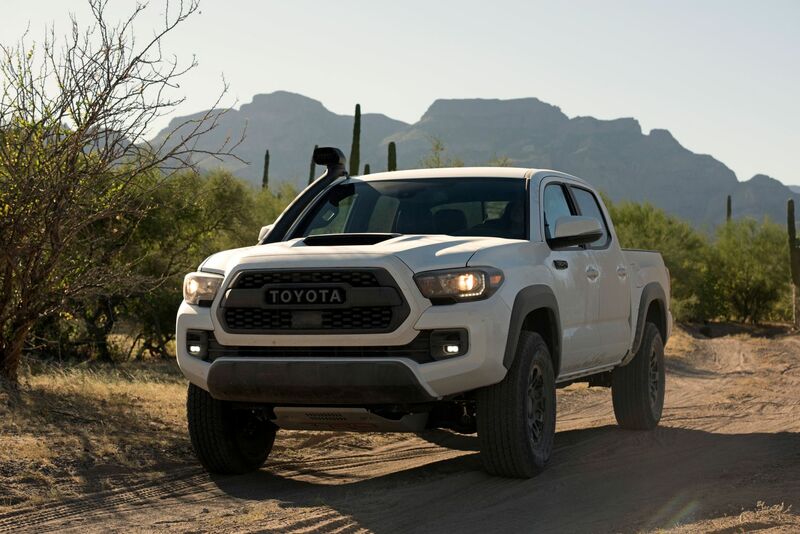 The Tacoma also features 2.5-inch rear shocks that use 11 bypass zones (7 compression, 4 rebound) and are paired with2-inch piggyback reservoirs. A host of additional TRD equipment finds its way onto the new Tacoma TRD Pro, including an updated front skid plate with TRD red lettering while the cat-back TRD exhaust is accented with a new Black Chrome tip. Inside, the new Tacoma TRD Pro, like the entire TRD Pro lineup, will also offer a standard moonroof for 2019. 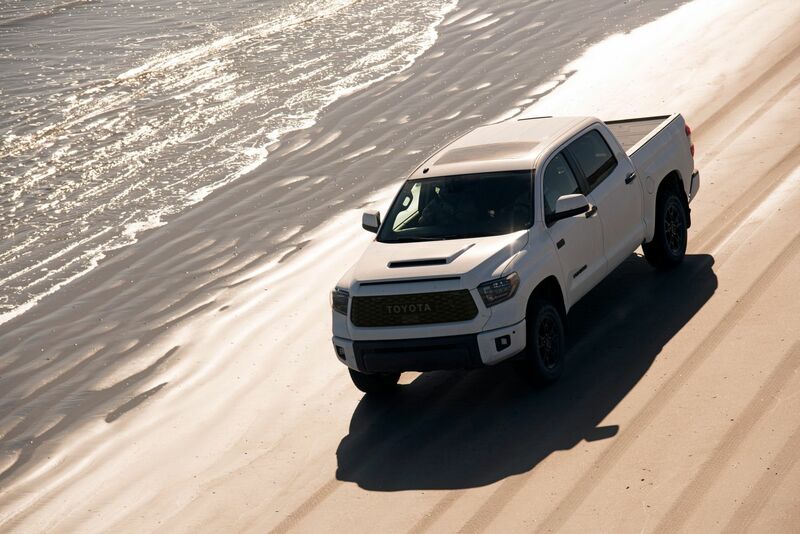 Tacoma is equipped with TRD Pro-branded floor mats and leather-trimmed seats with TRD Pro emblems on the front headrests. 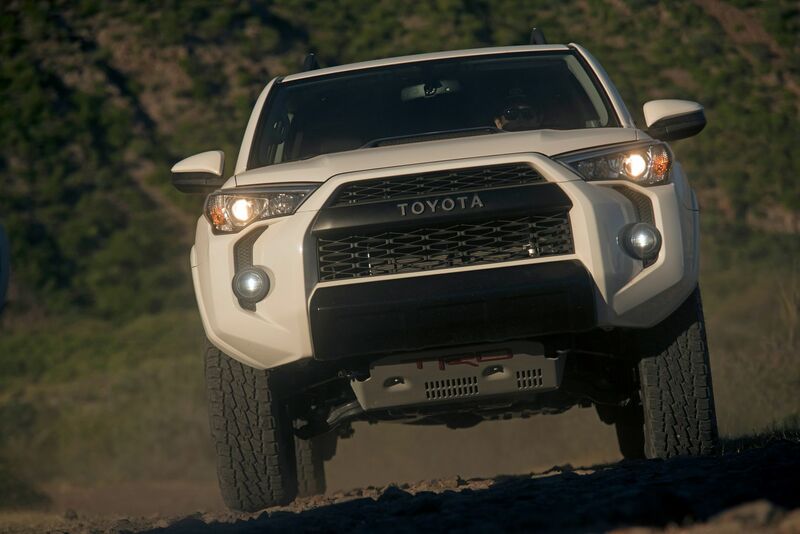 Distinguishing the exterior are unique TRD Pro badges, projector-beam headlights with black sport bezels and LED Daytime Running Lights (DRL), Rigid Industries LED fog lights, taillights with black sport bezels, and a black TOYOTA grille. 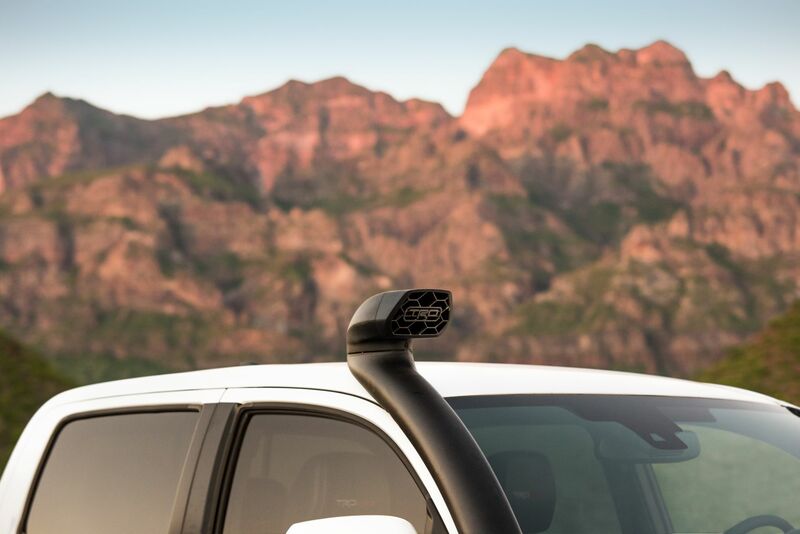 The most eye-catching of the Tacoma upgrades, no doubt, is the all-new TRD Desert Air Intake. 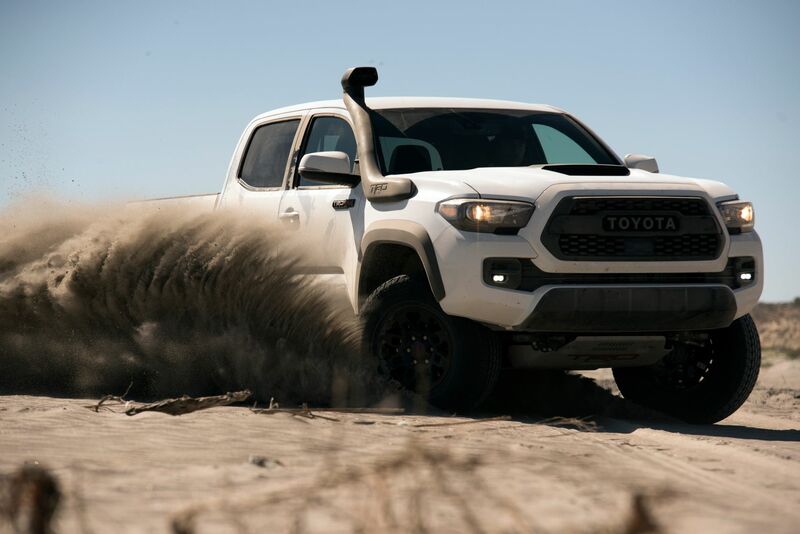 Designed to sustain consistent off-road performance no matter how silty or dirty the terrain gets, the TRD Desert Air Intake takes the 278-horsepower 3.5L V6 engine’s air intake away from dust that hovers inside the wheel well (where traditional air intakes are located) during off-road operation. This allows for air ingestion to occur in a cleaner space above the windshield, therefore benefiting filter longevity, and, ultimately, engine health. Taking a cue from little brother, big bro Tundra gets new Rigid Industries LED fog lights for improved visibility on and off the highway, in a variety of weather conditions. Tundra also features LED headlights with LED accent lights and a unique black treatment. 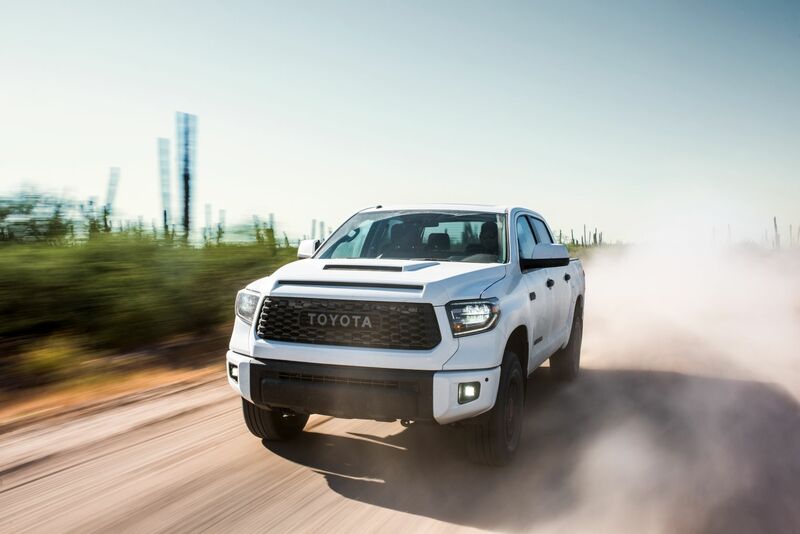 A new TOYOTA grille, plus, new hood scoop, add style to Tundra’s brawny front end. 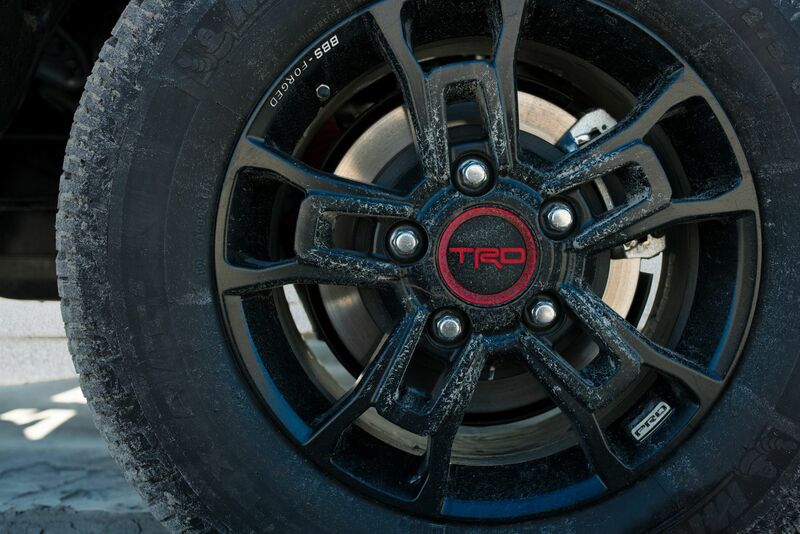 Out back, TRD Pro stamping is found on the bed’s rear quarter panels. New 18-inch BBS forged-aluminum, five-spoke satin black wheels are featured on the Tundra, which reduce un-sprung mass 3.35 lbs. per wheel (13.4 lbs. total) to improve cornering response and overall ride quality. The new wheels are wrapped in Michelin P275/65R18 all-terrain tires to provide a sure footing in dirt and on pavement. Inside, TRD Pro logos garnish the driver and front passenger leather seats, while red stitching accents the dash, seats and armrests. TRD Pro floor mats, shift knob and a centre-console emblem help complete the distinctive look. Providing added growl on the highway and the trail is a dual TRD Pro exhaust, which is fitted with new Black Chrome exhaust tips. 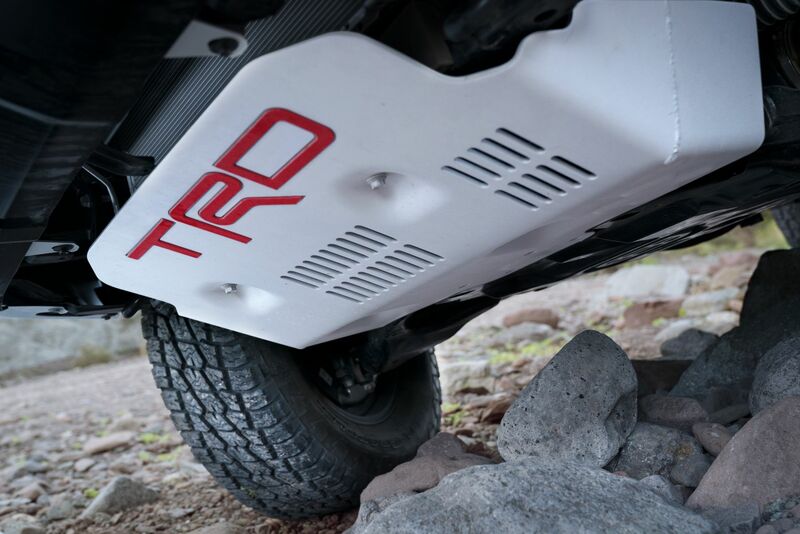 A TRD Pro 1/4-inch skid plate sporting signature red Toyota lettering is found underneath the front end. 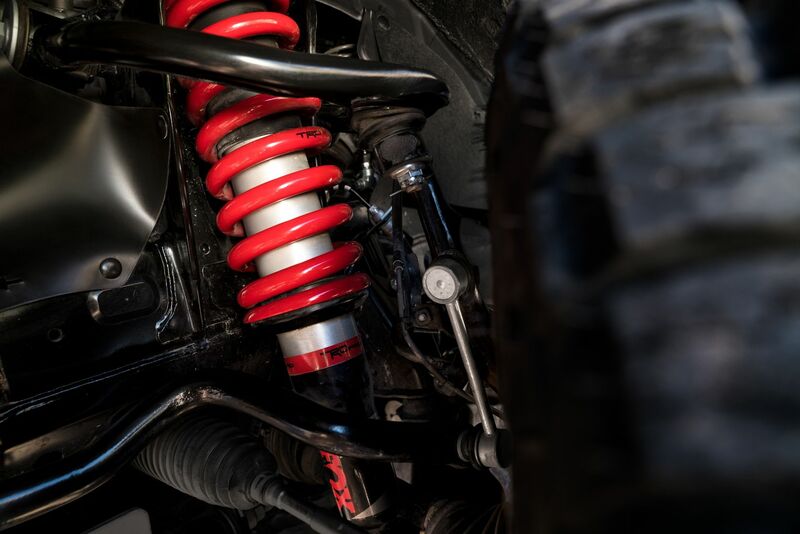 4Runner’s Fox shocks not only enhance its off-road performance, but paired with the TRD-tuned front springs, the package lifts its front 1 inch compared to other grades, while also providing nearly 1 inch of additional wheel travel. The 2.5-inch front shocks employ 46 mm pistons and include 7 bypass zones (4 compression, 3 rebound). In the rear, the 2.5-inch Fox shocks feature 11 bypass zones (7 compression, 4 rebound) to fine-tune the low- and high-speed compression, and 2-inch piggyback reservoirs house additional oil to retain damping performance when it’s needed most. A unique TRD roost shield offers additional protection for the inverted shock design in the rear. Like Tacoma, 4Runner TRD Pro passengers can enjoy TRD Pro floor mats, TRD shift knob, and red-stitched Softex seats with red TRD logos on the font headrests. Additional TRD Pro exterior features include LED fog lights, blacked-out TOYOTA grille, and projector-beam headlights with smoked trim. Dating back to 1979, Toyota Racing Development (TRD) has developed chassis, engines and parts design for nearly 40 years. TRD supported off-road legend Ivan “Ironman” Stewart for 30 years on his path to multiple championships and race victories in Baja, U.S. off-road desert and short-course off-road races. TRD most recently celebrated CJ Greave’s 2017 Pro 4 Championship in The Off-Road Championship Series (TORC) and Martin Truex Jr.’s win of the 2017 Monster Energy NASCAR Cup Series Championship. 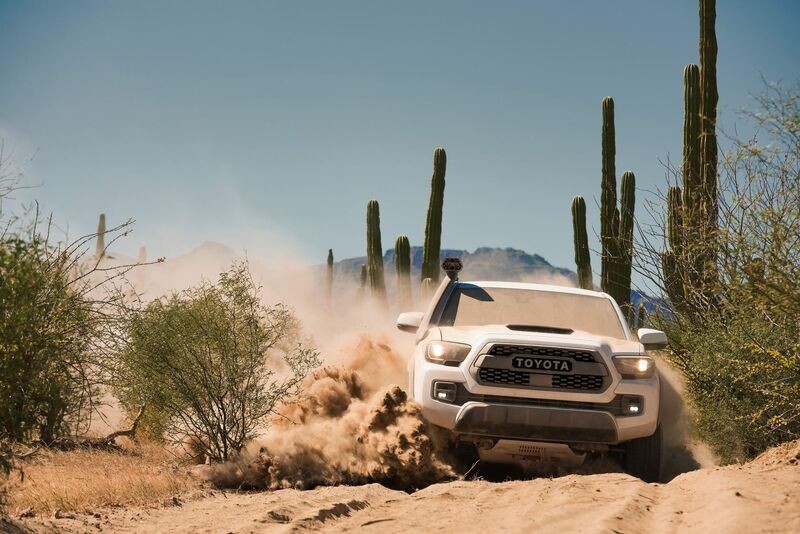 The 2019 TRD Pro suspension was tested and designed by TRD engineers. TRD also develops motorsport-derived accessories for Toyota and Lexus cars and trucks. Its. operations were first established in 1979 and are headquartered in Costa Mesa, Calif., with an additional facility in Salisbury, N.C.